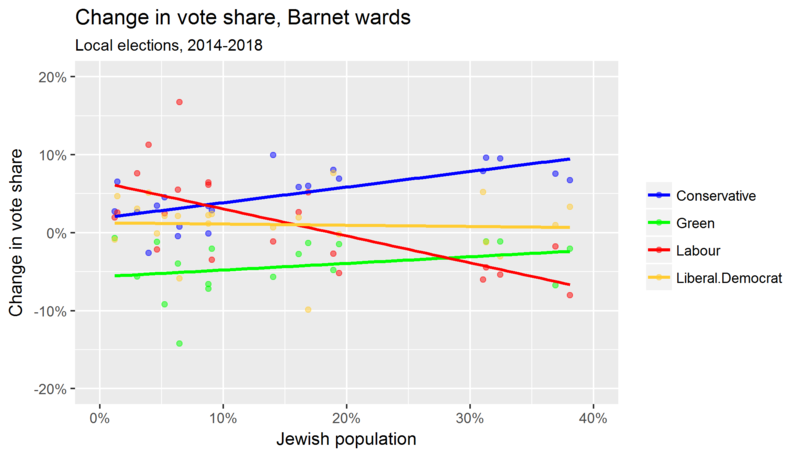 My analysis of the local election vote in Barnet has now been quite widely discussed, including on pages one and six of last week’s Jewish Chronicle. But while the chart I created does tell the story of the election, it’s a little difficult to read because it tries to show the whole story, with rises and falls in vote share for all four main parties. This leaves the reader to work out that there’s really just one central narrative of shifts between the two largest of those four parties, while nothing really happens with the remainder. Theresa May argues that her party’s success in re-taking control of Barnet Council was a result of Jewish voters ‘reject[ing] the vile antisemitism’ within the Labour Party. Do the numbers back her up? Yes. Just look at the chart above, which is based on ward-by-ward voting figures and the 2011 census. 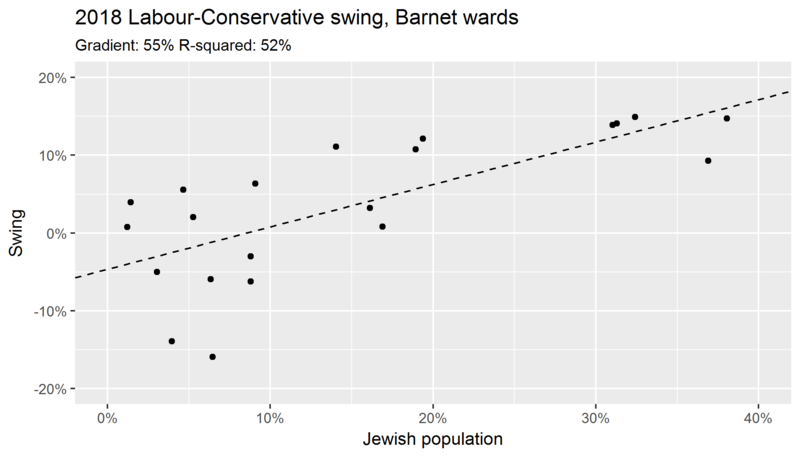 Labour picked up votes only in those parts of Barnet where the Jewish population was low; the more Jews there were within a ward, the more likely it was to lose them instead. The red trend line falls more steeply than the blue trend line climbs, suggesting that not all Labour’s lost Jewish votes will have gone to the Tories. And in the wards with few Jewish voters, Labour tended to gain about as many votes as the Green Party lost, giving us a clue as to where the votes it picked up came from, and why. 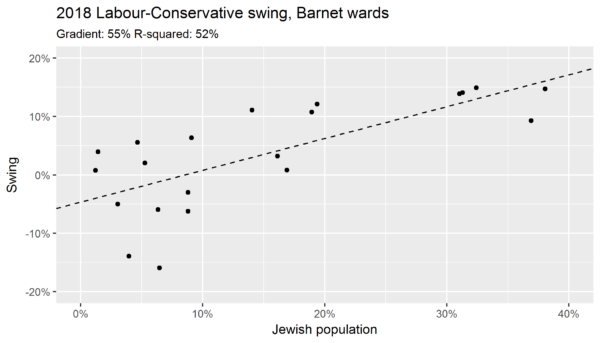 But the message here is clear, and much starker than in June, when the ex-Labour vote in Jewish areas seems to have gone to the Liberal Democrats rather than the Tories. That message is that many left-leaning Jews now see Labour as an institutionally antisemitic organisation that must be kept from power even at the cost of voting for a party on the opposite side of the political spectrum.